These Uazali, or "Warriors," are slightly Hellenized warbands from the southern coast of Mikra Asia, well suited to irregular combat at range and in melee. The Uazali are warbands of soldiers from the peoples of the southern coast of Mikra Asia: the Karians, Lykians, Pamphylians, and Pisidians. These warlike peoples have long traditions of military service abroad, and of nearly constant local warfare between the small cities and towns separated by the towering heights of the western Taurus. These Uazali are skilled mountain fighters. Their name comes from the Lykian tongue, and means "Warriors," and is similar also to the words used by the other peoples along the southern coast of Mikra Asia, all of whose languages derived primarily from the Hittite tongue. The Uazali carry a solid rectangular shield slung over the shoulder to ease the burden on the arms, emblazoned with signs of their peoples, and wear a solid Phrygian helm, a common form of protection among those in Asia who could afford such things. For weapons, they carry several javelins and a lengthened xiphos sword, which became a popular weapon in Mikra Asia, both as a result of the Iphikratid reforms, and out of experience fighting the Galatai, with their longswords. Their shields and helmets provide them a great deal of protection compared to most other skirmishing units, and their ferocity in melee surpasses most of their peers. Historically, many young men from Karia, Lykia, Pamphylia and Pisidia went overseas to serve as mercenaries, or were recruited in their native lands as militias and katoikoi for the successors. 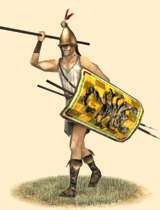 Many of the most Hellenized inhabitants joined the ranks of thureophoroi and other medium infantry units in other lands. Many others, however, stayed closer to their native infantry traditions, and served abroad as warrior bands, or as locally-recruited troops in their own lands. They were used to great effect in irregular mountain combat, but also distinguished themselves in assaults, and if they end up in the battle line in major pitched battle, a good commander will maximize their skirmishing and melee abilities by using them in a flanking, ambushing, or screening role if at all possible.